This flog is proud to present the very first guest recipe(s) submission, from Christina (Sim) Keddie. 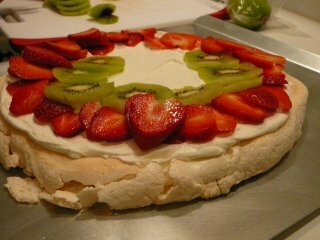 The dishes consist of Florentine Meatballs, a special Keddie family traditional Pavlova, and lastly, a cookies and cream trifle. Completely drain defrosted spinach (Rachael Ray recommends wringing it dry in a clean kitchen towel, but I don't like the mess, so I just drained it really well in a metal colander). Place ground turkey in a large bowl and make a well in the center. Add the spinach, all but 3 tbsps of the onion, all of the garlic, the egg, about 1/4 cup of the milk, the bread crumbs, grated parm, salt and pepper. Mix it all in. Form into 12 large balls (a good handful each) and drizzle with olive oil. While the meatballs are in the oven, heat a small sauce pot over medium heat. Add a drizzle (about 1 tbsp) of olive oil and the butter. When the butter is melted, add the reserved 3 tbsps of chopped onions and cook for 2 minutes. Whisk in the flour and cook for 1 minute, then whisk in the remaining 1-1/2 cups milk and the cup of stock. Bring to a boil, then stir in the shredded cheese. Season the sauce with salt, pepper, and nutmeg; turn the heat to the lowest setting and stir until the cheese melts. 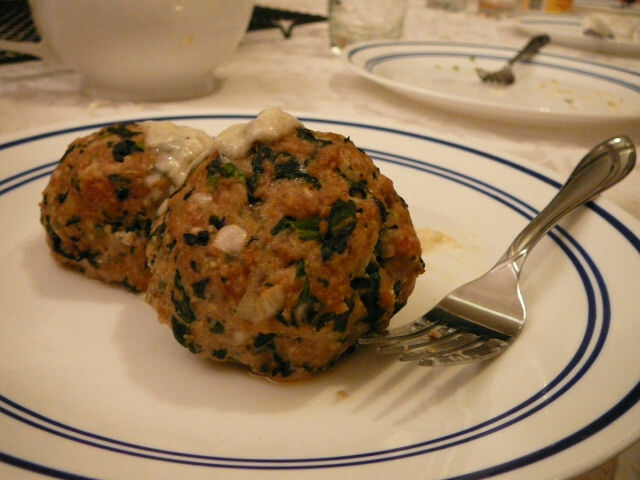 Place 3 meatballs on each dinner plate and top with sauce, then garnish with parsley. Gradually add 2/3 cup of sugar -- whip the mixture after each addition, again until stiff peaks form. Add the cornstarch to the remaining 1/3 cup of sugar, and gradually add this into the egg white mixture, whipping after each addition. Add the vinegar while adding the sugar/cornstarch mixture (I added a heaping spoonful of the cornstarch mixture and 1/2 tsp of vinegar, then whipped the mixture, then repeated until I had added all the cornstarch mixture and all the vinegar). Whip the mixture well, until stiff peaks form. Grease a 10" round tray or a cookie sheet. Place ungreased wax paper onto the sheet. Put egg white mixture in a heap on the waxed paper. Using a wet table knife or rubber spatula, spread the mixture into a circle about 8" in diameter. Bake for 1 hour -- do not open the oven door during the baking process, in order to ensure the fluffiest possible meringue. Whip 1/2 pint whipping cream -- again, I recommend the Kitchenaid stand mixer, starting out at a low speed and whipping at medium until thick. 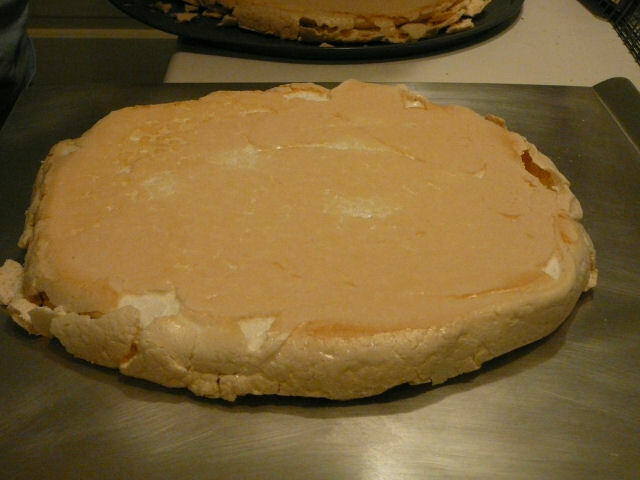 Spread on top of the meringue. Cover with sliced fruit. In the large bowl of an electric mixer, combine pudding, cream cheese and 3 cups milk. Mix on low speed until well-blended. (It's okay if small pieces of cream cheese remain.) Set aside. 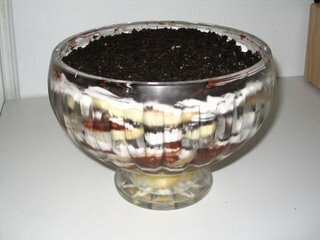 Split ladyfingers in half lengthwise, and line the bottom of a (16-cup) trifle bowl or glass bowl with half a package of them (or 6 whole ladyfingers), overlapping if necessary. Drizzle 1/4 cup milk, 1 tablespoon at a time, over ladyfingers, thoroughly moistening them. Spread 1/4 of the pudding mixture over the ladyfingers. Spread 1/4 of the whipped topping over the pudding. Coarsely chop 8 of the Oreo cookies, and sprinkle them over the topping. Repeat these layers 3 more times, ending with cookie pieces. Cover with plastic wrap, and refrigerate at least 6 hours (or up to 24 hours) to let the flavors blend. Serve in dessert bowls. Garnish with additional cookies if desired. NOTE 1: Be sure to use "instant" pudding (the no-cook variety). If you can't find devil's food chocolate pudding, plain chocolate makes a fine subsitute, but is milder tasting. 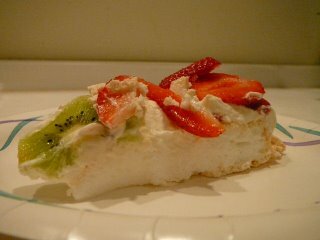 If you can't find ladyfingers, you can substitute thin slices of angel food cake.